At Xero, we use the power of technology to foster innovation, connection and entrepreneurialism. To create beautiful work that makes a difference. This is why each month, we speak to business leaders within our like-minded community – to see how they apply similar values to shape their businesses, and their futures. This month, we speak to Ted Gethen – founder of The Black Label Tailoring. Together with his business partner, Brendan, Ted has built a strong supply chain and opened four stores which give men the opportunity to dress with style and comfort, at a price point they can afford. Ted tells us in his words why personal customer service has become the cornerstone of their success. And also how, in a world of internet shopping, their bricks-and-mortar business continues to thrive. “The Black Label Tailoring has been around for five years now. Back in those earlier days, my business partner Brendan and I were two young guys who’d been brought up with a taste for men’s style. But we found we couldn’t push those tastes in Sydney or Brisbane – or most of Australia really. There just weren’t many smart dressing options for guys. “Most of the stuff we liked or wore was bought overseas, in places like Hong Kong or Italy. We wanted to bring that same taste for sharp suiting to Sydney, Brisbane or Canberra. But we wanted to remove the prices you normally pay for the exclusive stuff. We didn’t want to open a store full of clothes you’d have to re-mortgage your house to afford. “Our business journey has been a long path. Lots of 14-hour workdays where we are forced to wear many hats – but we didn’t want to rush into things. We didn’t know too much about brand development and we wanted everything to evolve quite naturally. Brendan and I ran a previous business together, where we rushed into orders and situations that in hindsight we quite regret. We learned from that. We took our time. “In an industry like ours, creating strong linkages and building a solid, tight-knit supply chain are the cornerstones to positive growth. If you’ve burnt a bridge there’s no crossing over it at a later date. “But it’s not just about the product. Gaining the trust and loyalty of your customers is the biggest boost for your brand image. Without it, you’re just swimming around in circles. You can do all the marketing in the world, but if you haven’t got the foundations of great customer service you won’t get repeat customers and you won’t get word-of-mouth recommendations. “We see more and more businesses shifting their focus online to boost margin, but I think the ones that will remain successful are the ones that pay attention to the offline parts too. From choosing down-to-earth expert staff to your store design and fit-outs, or your product design and packaging – every single detail boosts a customer’s perception of brand value. “We judge our success by the obvious conventions. How much stock we move, the number of stores we have, and our revenue. But it’s about the evolution we are sparking too. I know it may sound cheesy, but we like to think we’re changing the perception of men’s dressing and men’s style, little by little, each day, with each client. Finish this sentence. Account reconciliation makes me feel like… Kicking back and enjoying a whisky, as I have so much more time now. 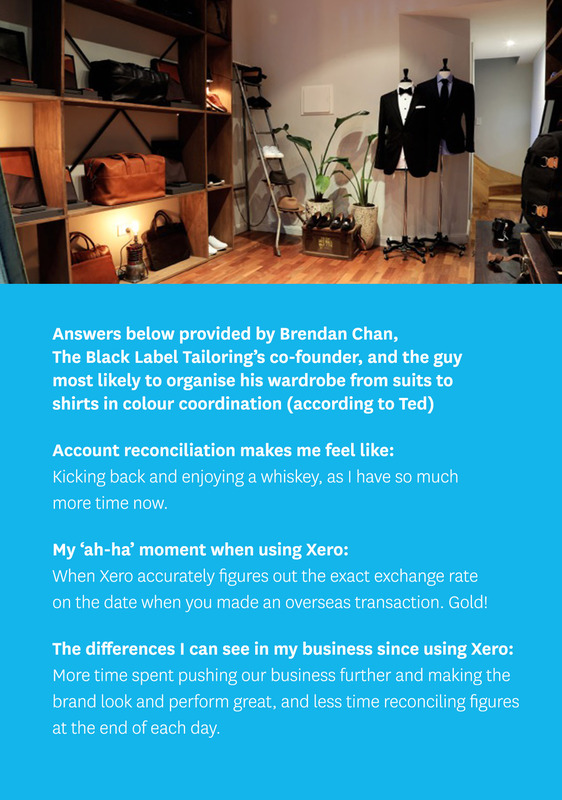 My ‘ah-ha’ moment when using Xero: When Xero accurately figures out the exact exchange rate on the date you made an overseas transaction. Gold! The differences I can see in my business since using Xero: More time spent pushing our business further and making the brand look and perform great, and less time reconciling figures at the end of each day. The post A retailer explains how you can still make a living with a bricks-and-mortar store appeared first on Xero Blog. Percentage columns for the income statement are here!